For other people named Samuel Roberts, see Samuel Roberts (disambiguation). Roberts performing at Mercury Lounge in New York City, New York on February 2014. 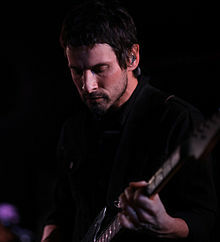 Sam Roberts (born October 2, 1974) is a Canadian rock singer-songwriter who has released six albums and has been signed to Universal (Canada) since 2002. His debut EP The Inhuman Condition, reached the Canadian charts in 2002. He is backed up by the Sam Roberts Band when performing live. Born in Westmount, to South African immigrants who had arrived in Montreal three weeks earlier, Roberts grew up on Cedar Avenue in Pointe-Claire, where his family moved to when he was five years old. Roberts is an alumnus of St. Edmund Elementary School, Beaconsfield, Loyola High School, N.D.G. and John Abbott College, Ste. Anne de Bellevue and McGill University. Roberts' first band was William in 1993, that changed into Northstar in 1998. As William they put out a single, "The Piranha" in 1996, while as Northstar they released a self-titled EP in 1998, but never got a major record contract and broke up in 1999. After disbanding Northstar, Roberts recorded a twelve track demo, "Brother Down", which formed the basis for the EP, The Inhuman Condition released in 2002. Recorded with Jordan Zadorozny, Roberts "recorded a song a day". Roberts signed with Secret Weapon Management and began to perform live. With the assistance of Linda Bush at Universal he signed a record contract with MapleMusic Recordings. MapleMusic released the six track EP culled from the demo with Roberts noting that "it is not something I had intended to be my first real foray into the music world but I couldn't turn my back on such a chance". It included two breakthrough singles, "Brother Down" (released in mid-2002) and "Don't Walk Away Eileen" (released in late 2002) which were heavily promoted in the Canadian market. In August 2002, Roberts signed with Universal Music. In November 2002, Roberts won the CASBY Award for "Favourite New Artist". In 2003, he released his major label debut album, We Were Born in a Flame, with the singles "Where Have All the Good People Gone?" and "Hard Road" garnering success in the Canadian market. 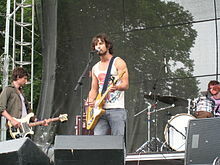 Sam Roberts performing at Lollapalooza in 2007. Robert's second album, Chemical City, was released in April 2006, with the first single "The Gate" topping as a #1 hit on Canadian radio. The second single, "Bridge to Nowhere", won the Juno Award for Video of the Year in 2007. The third single released on Canadian radio, "With a Bullet", received little critical acclaim and no video for it was released. Roberts' third album, Love at the End of the World, released in May 2008, debuted at #1 on the Canadian album chart, a first for Roberts. The lead single, "Them Kids", debuted on iTunes on March 4, 2008. Roberts released his fourth studio album, Collider, on May 10, 2011. It is the first album under the moniker "Sam Roberts Band" instead of "Sam Roberts". The first single, "I Feel You" was officially released to Canadian radio on February 28, with an iTunes Canada release of March 8. On November 20, 2013, Roberts announced the release of next album, Lo-Fantasy, which was released by Paper Bag Records on February 11, 2014. Sam Roberts' Band released the Counting the Days EP on April 18, 2015. Their sixth regular studio album, Terraform, was released October 28, 2016. On September 12, 2016, a North-American tour was announced to promote their new album. The Juno Awards is a Canadian awards ceremony presented annually by the Canadian Academy of Recording Arts and Sciences. The MuchMusic Video Awards is an annual awards ceremony presented by the Canadian music video channel MuchMusic. Roberts has received five awards from fourteen nominations. July 31, 2003: Opening performer at Molson Canadian Rocks for Toronto, otherwise referred to as SARStock, promoted to mitigate the economic downturn in Toronto following a limited outbreak of Severe Acute Respiratory Syndrome (SARS). November 16, 2003: Canadian Football League's (CFL) 91st Grey Cup halftime show in Regina, Saskatchewan. July 2, 2005: Live 8 concert in Barrie, Ontario. January 1, 2008: AMP Energy NHL Winter Classic, outdoor ice hockey game in Buffalo, New York. July 18,19 2009: Performed at Folk on the Rocks, in Yellowknife, Northwest Territories. August 7, 2009: Performed a free concert at Cole Harbour, Nova Scotia, in honour of Sidney Crosby and his Stanley Cup win. February 20, 2010: Performed at 2010 Olympics in Vancouver. December 31, 2010: Performed free concert in Brampton, Ontario for New Year's Eve celebrations. June 25, 2011: Performed at Bobcaygeon Musicfest in Bobcaygeon. July 1, 2011: Performed a free concert in Ottawa on Canada Day for Prince William, Duke of Cambridge, and his wife Catherine, Duchess of Cambridge. September 9, 2011: Performed at University of Toronto's FROSH week. September 20, 2011: Performed at Mohawk College's FROSH week. December 31, 2013: Performed at Niagara Falls' New Year's concert alongside Serena Ryder and Demi Lovato. ^ "Sam Roberts". Montreal Gazette. 28 March 2012. ^ a b Higgs, Jennifer. "Sam Roberts". The Canadian Encyclopedia. Retrieved 2016-12-03. ^ "Northstar (10) - Northstar". Discogs. Retrieved 2016-12-03. ^ "Sam Roberts Biography". MapleMusic Recordings. Retrieved 2008-11-22. ^ LeBlanc, Larry (2002-07-27). Roberts set for 'Inhuman' Success. Billboard Magazine. Nielsen Inc. p. 41. ISSN 0006-2510. ^ Sam Roberts Signs With Universal. Chart Attack. Retrieved January 31, 2019. ^ "Simple Plan, Treble Charger Win At The 2002 Casby Awards". Chart Attack. Retrieved February 3, 2019. ^ "A whole lot of love for Sam Roberts". Toronto Sun. 2008-05-30. Retrieved 2008-06-01. ^ "Upcoming Canadian Releases for 2011!". CBC.ca. 2011-01-12. Archived from the original on 2010-07-13. Retrieved 2011-01-17. ^ "Sam Roberts Band Confirms New Album 'Lo-Fantasy' Out Feb 11!". Paper Bag Records. Archived from the original on 2014-02-22. ^ Taylor, Luke (March 27, 2014). "The Current's Guitar Collection: Sam Roberts". The Current. Retrieved 2016-12-03. ^ "Billy Talent, Kardinal up for MuchMusic video honours". CBC. 2006-05-24. Retrieved 2008-11-20. ^ "Winners". MuchMusic. Archived from the original on 2008-12-30. Retrieved 2008-11-20. "Where Have All the Good People Gone?" This page was last edited on 18 February 2019, at 13:36 (UTC).